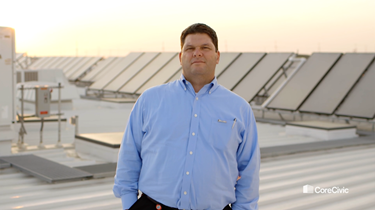 This Earth Day, Senior Director of Design Tim Aebie shows how CoreCivic is reducing environmental impacts with sustainable design, recycling and efficient energy usage. Watch as he showcases the eco-friendly features that earned Otay Mesa Detention Center in San Diego our company’s first LEED Silver certification. Through CoreCivic’s conservation efforts, Otay Mesa uses 50 to 60 percent less of every utility versus comparable facilities.